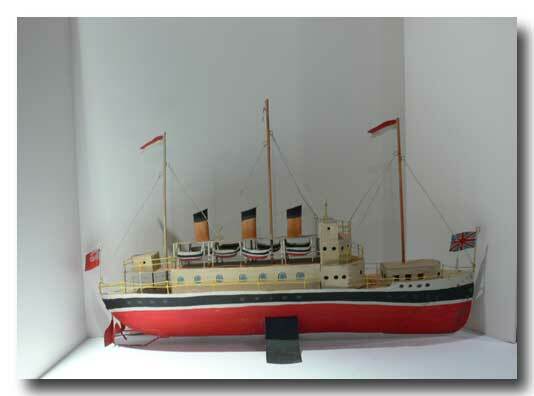 A HANDMADE & HAND-PAINTED TIN MODEL OF A PRE-WWI MERCHANT SHIP W/ 8 LIFEBOATS, AN EXTERNAL SINGLE SCREW PROPELLER AND FLYING THE RED ENSIGN OF THE ROYAL MERCHANT NAVY AT THE BOW & THE BRITISH UNION FLAG & NAVAL JACK FROM THE STERN. 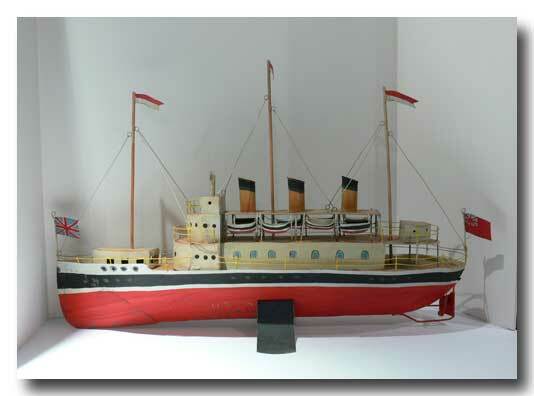 THERE ARE 3 STRIPED PENNANTS ON THE MASTS. INCLUDES A METAL V-SHAPED STAND. CONDITION IS VERY GOOD WITH ONLY THE REAR FLAG BEING REGLUED TO IT’S POST. I BOUGHT THIS AT AUCTION & HAVE NO IDEA WHO MADE IT OR IT’S AGE. IT’S APPROX. 25 INCHES LONG BY 16 INCHES HIGH. I’M GUESSING ITS AGE AT 1950’S. ALL TIN & WIRE.